County of Norfolk: Arminghall, Bixley, Bracon Ash, Bramerton, Caistor St Edmund, Colney, Cringleford, East Carleton, Dunston, Flordon, Framingham Earl, Framingham Pigot, Great Melton, Hethel, Hethersett (2), Holverston, Intwood, Keswick, Ketteringham, Kirby Bedon, Little Melton, Markshall, Mulbarton, Newton Flotman, Poringland, Rockland St Mary, Saxlingham Nethergate, Saxlingham Thorpe, Shotesham—All Saints, Shotesham—St Mary and St Martin, Stoke—Holy Cross, Surlingham, Swainsthorpe, Swardeston, Trowse with Newton, Whitlingham, Wreningham. The population falling within the union at the 1831 census had been 10,739 with parishes ranging in size from Markshall (population 32) to Hethersett (1,080). The average annual poor-rate expenditure for the period 1833-35 had been £10,231 or 19s.1d. per head of the population. A new union workhouse was built in 1836 at Swainsthorpe. The Poor Law Commissioners authorised an expenditure of £6,200 on construction of the building which was to accommodate 250 inmates. The site of the workhouse is reputed to have been in a valley so as not to offend the view of the local squire. The building contained around a million bricks which were made in Swainsthorpe brickyard and carried across the fields direct to the site. It was designed by John Brown, the Norfolk county surveyor. Brown designed several other Norfolk workhouses at Blofield, Docking and Yarmouth, as well as ones in Suffolk (Plomesgate, Stow), and Essex (Colchester). Like Blofield and Docking, Henstead was based on a double-cruciform plan. The site layout is shown on the 1882 map below. Henstead site from the south-east, 2000. Henstead workhouse from the south, c.1903. At the centre, a three-storey block contained the Guardians' board-room, waiting room, and Master's quarters. To the front were the porter's room, receiving wards and vagrants' cells. To its rear were the workhouse laundry and kitchens. Henstead centre block from the south, 2000. Females were accommodated to the west of the centre and males to the right. On each side, the wing nearest the centre contained an inmates dining hall. The westernmost wing contained the school-room and children's day-room. An infirmary was located in the southern wing at each side. Henstead female side and central block from the south, 2000. Henstead from the north-east, 2000. Although the workhouse could hold 250, the average number of residents was typically in the region of 60 or 70. The officer in charge of the establishment was originally known as the Governor, and was not known as the Master until much later in the nineteenth century. In the 1840s, a complaint was made that the Governor was running his own poultry farm. As a result, he was forbidden to keep for his own use more than six hens and one cockerel. 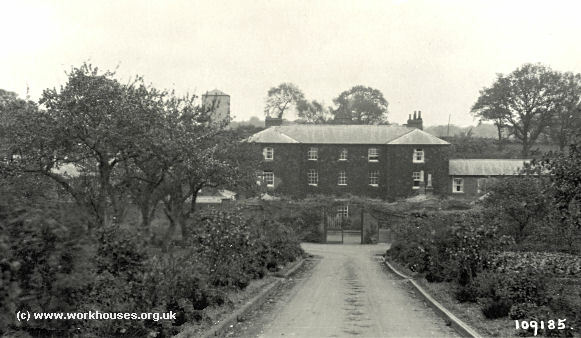 After 1948, the former workhouse became part of the National Health Service and was known as the Vale Hospital. It provided care for the elderly mentally ill. 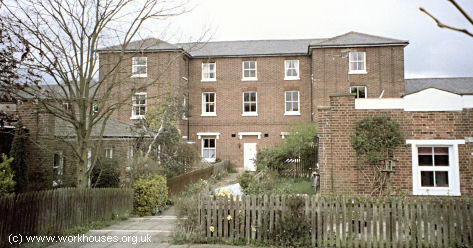 Following the closure of the hospital in 1984, the buildings were converted to residential use. Norfolk Record Office, The Archive Centre, Martineau Lane, Norwich NR1 2DQ. Holdings include: Guardians' minute books (1835-1930, missing 1886 and 1910); Ledgers (1836-1930); etc.